The 360waveprocess beginners method to 360 waves is very popular due to its simplicity many guys have been able to achieve great results by adopting the method. My beginners method is different from other’s because it focuses on helping the guys who have the most trouble getting waves. It does not ignore the guys who get waves fast. It was just created with the people who will have the most trouble in mind. Coarse hair waver usually find it most difficult to see results. I understand this because my hair was once very coarse. My texture has changed a lot since I’ve begun this 360 wave journey, but I can never forget how much time and effort went into getting my hair the way it is now. Full 360 waves all around! To view the beginners method click here (Coming soon). I call this method the Fast, Accelerated Wolfing Method because it will work to almost instantly increase the look of the waves that you already have in your head. This method will show you how to lay your 360 waves down and make them deeper and more visible. Overall, this wave method will show you how to make your waves pop out so they can be more noticeable. This is a wolfing method but it also works when you have a fresh haircut. Beginners can do this method once a day to increase progress on the sides. To view this method click here (Coming Soon). 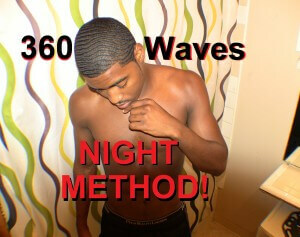 My morning method for 360 waves is similar to the method listed above. This morning method is meant to help a waver get their hair ready to look the best it will look. The day method is simple and quick. It should take no longer than 30 minutes. It requires the simple tool that every real waver has. All you need for this method is shampoo, conditioner, a hair brush (preferably medium), a du-rag, and a hair product of your choice is optional. This method aims to have your waves looking fresh all through out the day. To view this method click here (Coming soon). The 360waveprocess day method is like the most important of all the 360 wave process. I say this because I created this method to help guys understand just how much brushing it takes to get 360 waves. This method focuses on the brushing time that is required for guys who will have the most trouble getting waves. Brushing is the single most important step to getting waves. This method will help you understand just how much brushing is involved in the process. Let me tell you in advance, It takes a lot of brushing however, it should be fun to brush. You shouldn’t feel like its work. To view this method click here (Coming Soon). The night method is really quick and simple. There’s not much to it. The purpose of the night method is to spend time examining your waves, looking for weak spots, and improving areas that need improvement. The night method is meant for wavers to take the time in the night, before bed, to better their waves. Night method and vamping go hand in hand. The night method video was highly anticipated and the video explaining it is really entertaining. To view this method click here (Coming soon). Should i was my hair everyday for the morning method?